Editors Note – As smart TV’s become more and more popular, the rush for TV companies to sign up big brands to stream content on their Smart TV’s will get more and more fierce. LG have managed to bag one of these big fishes, walt disney and their 3D content. ENGLEWOOD CLIFFS, N.J., Oct. 4, 2012 /PRNewswire/ — LG Electronics USA has entered into an agreement with The Walt Disney Studios to add popular 3D movies for rental to the “3D World” application on LG’s Smart TV platform. Disney 3D content now available for rental includes such popular titles as the “Toy Story” trilogy and “Alice in Wonderland,” among many others. Additional 3D blockbuster titles are scheduled for the coming months, including “Marvel’s The Avengers,” and Disney-Pixar’s “Brave” on Nov. 13. “Providing consumers with the latest blockbuster hits from Disney is another boost for Smart TV in the home and a perfect fit for our family approach to enjoying our home entertainment products,” said James Fishler, senior vice president, marketing and go-to-market operations, LG Electronics USA. “Having these titles available through our Smart TV platform and on our CINEMA 3D HDTVs speaks volumes about LG’s commitment to continuously broadening the breadth of our offerings and partnerships so that consumers of all ages have access to an endless amount of entertainment, from online games to applications, broadcast and now Disney movie titles,” Fishler said. The addition of Disney content to the Smart TV platform addresses the desire for more 3D programming and complements LG CINEMA 3D Smart TVs most of which come with six pairs of 3D eyewear and are designed to deliver a comfortable, movie-theater-like 3D experience for the whole family. To give families a chance to experience this new 3D content, LG is offering a $50 redeemable coupon to new Smart TV buyers through Oct. 6. 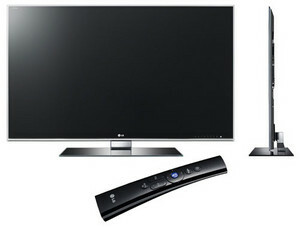 New Smart TV buyers can get the coupon at www.lg.com/3Dworld. 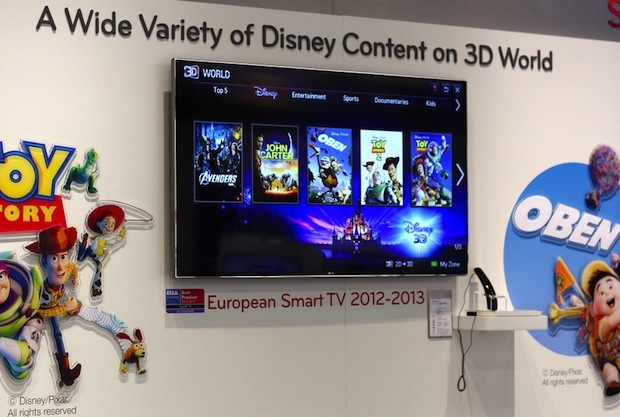 The 3D World LG Smart TV application already features multiple titles from Disney. By spring 2013, additional titles will be made available, including “Finding Nemo,” “Bolt,” “Gnomeo & Juliet,” “Tangled” and “Tron: Legacy,” among others. LG’s 3D World contains 2-day rental movies and also more than 300 free 3D videos from multiple categories like sports, kids and documentaries. Prices for rentals range between $4 and $8 dollars. LG’s 3D World is available via all LG Smart TVs including these series: LS5700, LM6200, LM6700, LM7600, LM8600, LM9600, PM9700, PM6700 and PM4700. In addition to enjoying 3D content from the 3D World app, Blu-ray Disc players and other sources, consumers can use LG’s upgraded 2D to 3D Conversion (with improved depth effect) to watch virtually any normal TV programming in immersive 3D. Smart TV devices include HDTVs, Blu-ray Disc Players and Network Home Theater Systems. Internet connection and certain subscriptions required and sold separately. Content and services vary by product and are subject to change without notice.